what an amazing amount of drivel from a single post. Let's look at the one word you have used against this product 'innovation'. Prey tell please any other manufacturer in this sector that has 'innovated' in any way using the same standard Intel/hardware components? I'm not saying that Apple have 'innovated' in any particular way in this product as opposed to the original MBA introduction, this is just another internal upgrade...like all of the followers around them. Unfortunately everything you have written is wrong. You are the problem - fanboys that believe anything they read on the internet. Apple has not "innovated" since the early 90s. They have done nothing but taken someone else's innovation and repackaged it in a well marketed shiny box. Claiming that they have "put fourth" the best hardware shows even more how little you know. Apple does not manufacture anything. They depend on true hardware companies to create for them. Yes they do assist in the design of the mobile, low end processors for their mass market products, but they do not manufacture anything. JKflipflop98, while I do not wish harm on anybody, I share your disgust with dsumanik. 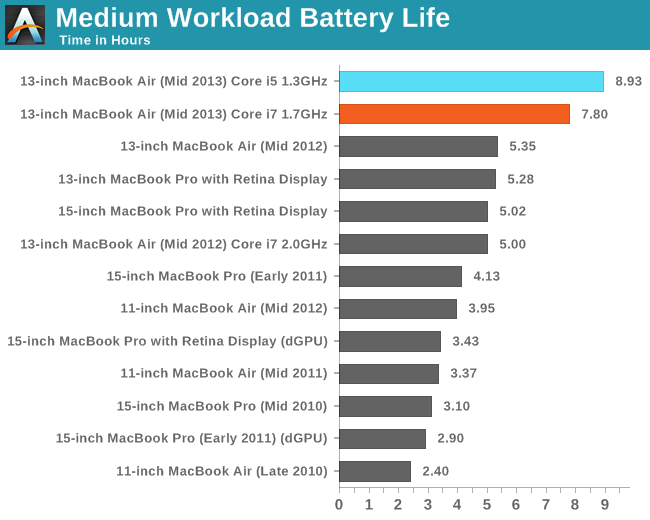 I have no inclination of getting an Apple MBA but Anandtech's MBA articles are great for comparing IVB to Haswell and i5 to i7, at least in a GPU-limited scenario. I am in the market for a new laptop and often see great deals on IVBs and the i7s are extremely tempting. 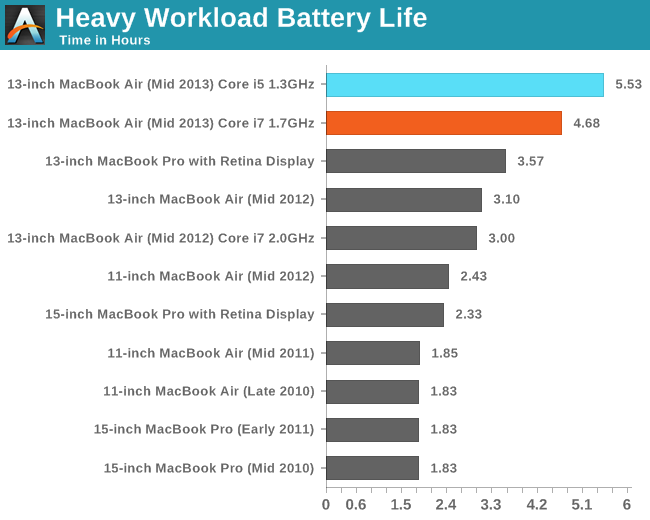 However thanks to Anand's articles, I will wait for the full Haswell line of i3, i5, i7s to be out before deciding. Also, considering the meager difference between i5 and 30% higher clocked i7, unless it is to do with thermal limits, I think I will stick with an i3 or i5 based Haswell. Though I would be curious in performance difference between these 15W i7s and the 47W i7s in Toshiba's laptops in performance, battery life, and temperature. So yes, even if I now have no inclination of getting an Apple MBA, these 3 articles provided enough information to deduce what processor I want in a laptop. As laptop processors are not generally interchangeable, these articles have helped me to key in on which laptops to eliminate from my search. To that extent I am very grateful to Anandtech for these articles. Furthermore, even if you don't like Apple, Apple generally has consistent hardware from generation to generation and often gets early editions of Intel processors (great for getting rid of deep sleep USB3.0 issues). Thus, with fewer variables from generation to generation, Apple computers make great test beds for testing out those few variables which are new. It is both amazing and sad that on a website with "tech" in its name you get people who think as unscientifically and biased as dsumanik that they cannot appreciate genuine research for the name behind the research. Stop turning the conversations towards apple vs whoever. My rant has nothing to do with apple being good or bad. Its ok for anand, you, me, or the rest of the general public to like apple. it's NOT ok for him to tell you apple is good when he isnt thinking that inside his own head. Why why... WHY would you ever tell someone to buy something you thought was inferior? Ok so anand was thinking it was broken. Ok maybe not broken, but at the very least slow...a step down from last years performance. its plain to see in the numbers, the new proc isnt a flat win across the board. Yet he still gave the original MBA a glowing review....then wrote a separate article recommending its purchase. Like that was the icing....why did he write that article lol? wouldn't you write that after apple had refreshed its entire line? Why right now...all of a sudden do we need an article telling us to buy the only 2013 model.....no one here is stupid, we know not to buy the last years model of anything!!!!! his true feelings were NOT reflected in the original article. End of story. he WANTS apple to be viewed in a positive light, even if he isn't feeling it inside himself. This isn't an isolated incident its been slowly happening for about 3-4 years now. He is writing articles telling you to buy something, that in his mind he felt was subpar. like seriously guys, don't you see a problem with that? ask yourself why someone would make that recommendation? Hate me all you want but the question still needs answering....why is it of PERSONAL interest for him to paint apple as rosey a picture as possible. I'm sorry sir, but your premise is false. I know nothing about Anand besides what's resides inside this website. That accompanied to a review of intel's pentium IV a real while ago turned me into a regular visitor. On both of the very well written articles relating this subject matter, Anand has been clear to accurately explain the DESIGN CHOICES Apple took, when building a computer whose main focus is not a performance crowd. - use of slower frequency CPU would for sure impact raw processing power, as has been perceived by the reviewer, who in fact went to the trouble of quantifying how much less raw power would you get when comparing a previous model. Now please, kindly take into consideration what sort of gains in term of battery life were achieved, WITH LITTLE TO NO IMPACT in consumer experience, because of such DESIGN CHOICES. - The same philosophy can also be observed in using a lesser frequency in a MUCH LARGER GPU, demoed similar to superior performance with noticeable gains in used wattage. This computer is all about mobility, no raw power. In it's premise of existing, a mobile computer, this ones generation seriously outperforms it's previous generation. 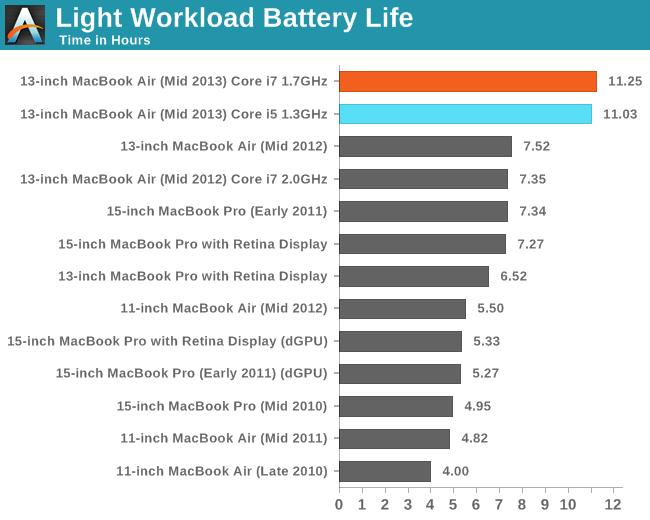 You DO know that Apple makes the best computers in the industry, and everything else is largely garbage, right?